A master plan to restore interest in nature by increasing access to parks is underway in Toledo. Set along the meandering Swan Creek, this metropark—one of more than 15—features a unique landscape. The creek’s winding curves create oxbows: bowing ponds made when high water changes the stream’s route. When the customer came to us wanting a unique, hybrid play space, we used the landscape as inspiration. We studied the available space in person and worked intimately with the park to develop a concept. It was decided that completely custom net structures would give us the most design flexibility. A net form for ages 2-5 mimics the oxbows of the preserve, and has two shade shelters with activities where little ones can just relax. 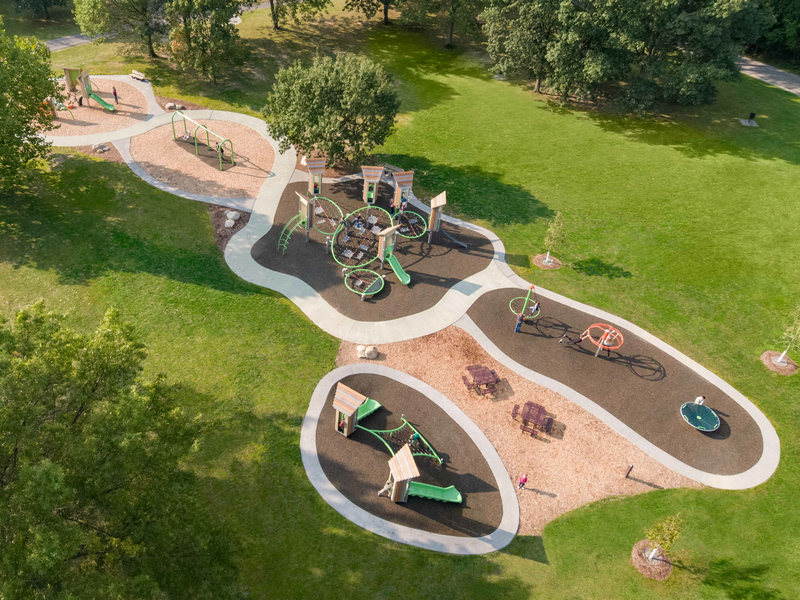 A custom net and two hill slides make use of the space’s natural contours, giving kids a variety of ways to ascend and descend from the hill. The main structure takes inspiration from post-and-platform systems, but replaces platforms with nets—something that would later inspire us to create infiNET™. Faux wood portals and the perfect color scheme complement the environment, inviting kids to explore the beauty of the outdoors in the Toledo area.